In a few days, we will be celebrating Halloween. A day for children to adorn scary and cute costumes and parade from door to door filling bags with candy. Adults and children will carve pumpkins and set them a glow with candles. They will decorate their front doors in cheap scary apparel in an attempt to create an ominously festive evening. After a couple of hours of handing out mini chocolate bars we will turn out the lights sit down on the couch to a scary movie and eat the remaining Halloween candy. (I always sub-consciously buy too much for this very purpose.) Halloween will be complete for another year with little thought to why and where this tradition began. Many don’t participate in Halloween anymore, and the rest of us don't really see it past the commercial event it has become, to line the pockets of candy and costume companies. October 31st seconds only to Christmas in retail sales. There was a time when Halloween was about welcoming the spirits of dead ancestors to walk the earth. The holiday of dead spirits is in fact a tradition that dates back long before candy and costume companies got a hold of it. Two thousand years ago, the Celts of Northern Europe celebrated the first festival of Samhain (pronounced ‘sow-in’ meaning end of summer.) Samhain marked the beginning of winter and the Celtic New Year. This one night a year the Celts believed the veil between the living and the dead was most permeable allowing the spirits of the dead to roam the earth. Families set out food and wine just in case their ancestors dropped by for a visit in the form of a black cat. For some it may have been a little unsettling sitting around waiting for spirits to manifest. This encouraged people to dress in costumes of the dead in order to camouflage themselves and blend in with the real spirits. Then parades began in the hopes of drawing the spirits away from their homes. Druid Priests built hilltop fires to encourage the end of winter and the return of the sun. For good fortune, people would bring the fires from the hilltop to hearths in their homes by way of carrying the hot embers in hollowed out turnips. To ensure a safe journey home and to ward off the evil spirits they would carve scary faces into the turnips, thus illuminating the first jack-o-lanterns. 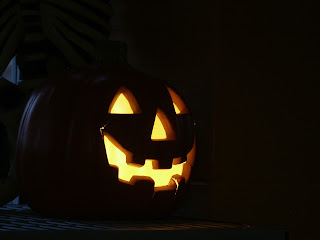 By the middle ages, the Catholic Church established a trio of holidays known as Hallowmas, October 31st became all Hallows eve, November 1st became All Saints Day and November 2nd became All Souls Day. In place of setting out treats for the dead, Catholics were encouraged to offer “soul cakes” small pastries and breads to the poor in exchange for prayers for departed family members. Town’s people still masqueraded but now they dressed as angels, saints and devils and visited from house to house, a tradition that evolved into trick or treating. The Christian holiday was meant to end Samhain, instead it solidified the holiday of Halloween. Halloween did not take hold in North America until the 19th century with the arrival of Irish and Scottish immigrants. Prior a Catholism based tradition was not a popular idea and in light of the hysteria of the Salem Witch Trials, the thought of inviting devils to walk among the living was not highly encouraged. Once Halloween took hold in North America, it became a harvest festival, pumpkins replaced turnips, games and parties became the rage. As time passed, Halloween became less engaged by adults and became a children’s holiday. Today, Halloween bears little resemblance to its origin. Many would suggest our ancestors were naive to believe spirits of the dead walk among us. However, I can't be certain the commercialism that revolves around October 31st today makes us anymore the wiser. I also have to wonder what Halloween will look like 100 years from now? Will it exist at all? I for one would like to acknowledge the original intention of the day and would welcome sitting down to a glass of wine with the spirits of my dead ancestors. I may even get a few of my genealogy questions answered.... now that would be a treat.